Following the Note 5 global debut in Dubai, Infinix, the online focused smartphone brand of TRANSSION, today announced yet another game changing offering by launching an Android One device in the sub 10K smartphone segment. The all-new Infinix Note 5 is part of Android One program, designed to deliver the top notch Android OS experience that combines Google’s smartly designed software with built-in AI powered innovations like Google Lens & Google Assistant as well as highest grade of security. Following the brand’s debut in India last year in 2017, Infinix’s momentum has continued to grow in the region due to its strong product portfolio. 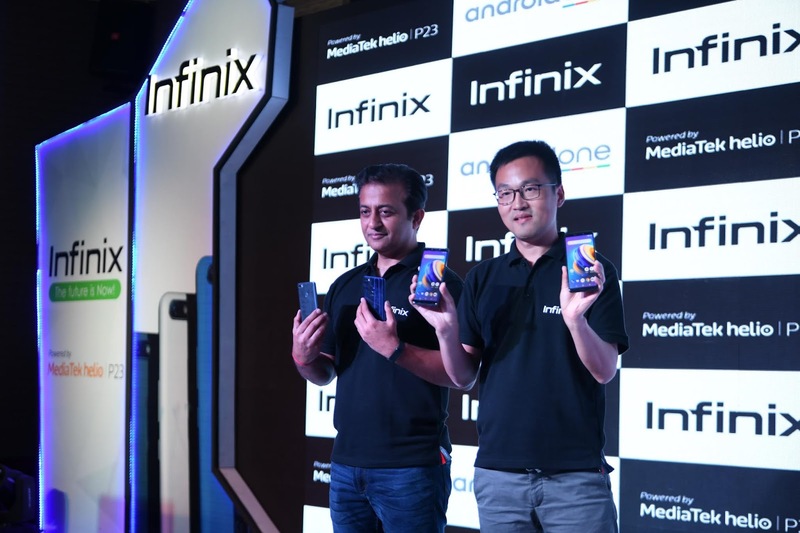 Commenting on this success, Benjamin Jiang, managing director of Infinix Mobile said, “We are committed to continuing pushing the boundaries and each offering from Infinix portfolio is a game-changer in the segment to scale new heights of product innovation and customer centricity in the products. We have always focused on bringing future-ready devices at affordable price points." Munish Seth, Android country director for India said, “Through the Android One program we aim to combine high quality hardware designed by our partners with smartly designed software by Google. We believe that products should be intuitive and secure. They should improve over time, and adapt to you to make your life easier – not the other way around. We want to accelerate how we scale this phone experience through the Android One program, where hardware innovations from partners like Infinix combine with the best of Google innovation at scale." Infinix’ NOTE 5 Android One phone runs with latest Android Oreo 8.1 OS combining Google’s smartly designed software, from the latest AI powered innovations such as Google Lens and Google Assistance to the highest grade of security, with beautifully designed hardware. Google’s smartly designed software will function smoothly with no bloatware or UI customisations to deliver an uncluttered Android experience. It also improves battery life by prioritizing background activity with the most important apps and helps solve storage stress on your device. Furthermore, security protections with Google Play Protect are built into every layer of your smartphone experience, so your device stays safe, fast and performs at its best. Google Photos lets you store an unlimited amount of photos and videos at high quality for free, and access them anywhere. Automatically organized and searchable by the people, places, and things in them, your photos and memories are always easy to find and share. Google Lens, lets you point your camera to learn more, take action, and interact with the world around you. With Google Lens, you can copy and paste text, find products online, learn about landmarks, add events to your calendar, look up movie posters, identify popular plants and animals, and more. Clocking in at a massive 4500mAh, the Infinix NOTE 5 battery allows you to enjoy a 3-day battery life on a single charge. It also comes with 18W fast charger which give one-day battery in half an hour of charge. Moreover, the battery comes with AI power management which tracks the consumer usage pattern of the smartphone and optimises the battery life according to the usage. Infinix NOTE 5 flaunts 5.99’’ Full HD+ screen with 18:9 display empower you to multi-task and enjoy a more dynamic seamless visual experience. Its 80% NTSC colour gamut helps in vising the natural colour reproduction and 500 nits ensure better viewing in bright lighting condition. It comes with 85% screen-to-body ratio, so bigger the screen, better the experience. The smartphone is built with 10-layer coating of reflective nano-chrome particles for a smooth & premium glass finish along with 2.5D curved glass edges design provides stunning look to NOTE 5 helping to stand out from the crowd. Making the photography more intuitive, Infinix NOTE 5 is endowed with 12MP rear camera with large 1.25-micron big pixel, f/2.0 aperture with dual LED flash for capturing brighter and sharper photographs in low light conditions. The smartphone boasts of AI based Auto Scene Detection (ASD) feature to enhance overall photography experience in outdoor scenario. When taking pictures, the smartphone automatically detects the scene details like lighting condition, brightness etc. and with the help of its deep learning algorithm, it intelligently matches the best camera parameters to the current scene, producing a perfect photo. The smartphone comes with AI based portrait mode, which identifies Object/Humans and put them in foreground and blurs everything else. It comes loaded with 7 shooting modes namely Normal, Beauty, Portrait, Professional, Panorama, Night and Time Lapse modes. Moving onto the Selfie camera of the smartphone, it is enabled with 16MP f/2.0, with AI beauty mode that produces the best suitable beauty plan for each user by automatically detecting 255 facial points of subject with the help of its deep learning algorithm. Additionally, AI Bokeh measures pixel by pixel as it focuses on the main focal point and blurs everything in the background to make you stand out in the pictures. Infinix NOTE 5 comes with a 4in1 pixel technology for low light conditions in which 4 pixels merges into one pixel and helps in capturing more light for better quality pictures. It also comes with Softlight flash which further enhances selfies even in low light conditions. Infinix NOTE 5 is powered by MediaTek Helio P23 MT 6763 2.0 Ghz Octa-Core processor based on 16 nanometer process which makes your device faster and power efficient and hence an ideal gaming and entertainment oriented smartphone. The device also brings Dual SIM, Dual VoLTE solution wherein consumer can enjoy 4G VoLTE services on both SIM simultaneously. The device comes with superfast Fingerprint sensor which unlocks the device in half a second. NOTE 5 comes with 3-in-1 card slot wherein you can put Dual Nano SIMs along with a dedicated SD card which is expandable up to 128GB. The new smartphone will be available exclusively via Flipkart India starting from 31st August, 2018 in three beautiful colours of Ice Blue, Milan Black and Berlin Grey. NOTE 5 is available in two variants – 3GB RAM + 32 GB storage for INR 9999 and 4GB RAM +64GB storage for INR 11999.